One of the first musicians I met when I returned to live jazz in New York (2004-2005) was the wonderful drummer Kevin Dorn, and through Kevin I met a number of musical individualists. One who made a powerful impression on me was saxophone master — no hyperbole here — Michael Hashim , whom I have heard over the years, memorably, on alto, tenor, and soprano. If you’ve been on the scene since the middle Seventies, you’ve run into Michael (sometimes “Mike”) playing with everyone from Jimmy Rowles, Benny Carter, Sammy Price, the Widespread Jazz Orchestra, and now with a variety of small groups and happily with the Microscopic Septet. Michael is also singular because of his sharply focused memory for people and sounds and events (and, sometimes, absurdities) and his wide range of interests. I can talk with him about art, comix, photography, literature, and I will come away more deeply informed. You will also see in these video interviews his dazzling articulateness: none of this is scripted, but he’s never at a loss for words: he’s not affected but his speech is polished and balanced. Earlier this summer, as another tributary to the interviews I’ve been doing with Dan Morgenstern (and there are more), I casually asked Michael if he’d be interested in sitting for my camera. He was, and so we spent a few hours on the afternoon of July 19, my admiring Michael’s insights and feeling terribly fortunate that I could record them for posterity. And, as you can see, he enjoyed himself. Incidentally, since I called on Michael (in the words of that venerable magazine feature by Pete Martin in The Saturday Evening Post sixty years ago) to tell us stories, to be a spiritual tour guide to worlds that many of us never encountered, I have chosen photographs of his very expressive face — without the ubiquitous saxophone attached. Here are two of the five segments I recorded: lose yourself in Michael’s tales. They are memorable and irreplaceable, full of surprises. There’s more to come. How reassuring it is to me to know that Michael Hashim exists and flourishes. The composition is Neal’s TIME LINE: his colleagues are Michael Kanan, piano; Greg Ruggiero, guitar. Fewer people know Neal as a fine record producer, a splendid videographer (the evidence is here, now a gifted documentary-maker. I was privileged to be in the audience last Thursday night when he showed his film about the engaged and engaging drummer / photographer Jimmy Wormworth to a very receptive audience. Neal has put the film on YouTube for all of us to enjoy at our leisure, for free. Although I tend to glance at my watch during documentaries, I sat rapt, and it wasn’t only because the stories were delightful. Neal has not resorted to fancy film tricks (although you HAVE to wait for the coda); he has gently stayed out of the way of his subject. And the stories! Tales of Paul Chambers, Charlie Rouse, George Braith, Lou Donaldson, Dizzy Gillespie . . . all the way up to the present, with Tardo Hammer, Jon Hendricks, Annie Ross, Dwayne Clemons, and other friends. In the Fifties Jimmy bought a Brownie camera and began to take candid photographs of his heroes and colleagues, and they are priceless, as is the cheerful commentary. The film is as close as we will get to sitting down with an amiable jazz legend who graciously unrolls fascinating anecdotes of his first-hand experience. At the end of the documentary, the audience stood and cheered. I said to someone on the way out, “Much better than a memorial service.” Neal has done something beautiful and lasting by celebrating and chronicling a great artist while that person is alive. I would like to see him get grant money to do more of these films, although I would hate to see him put the string bass in the closet. For the past five years I have been experimenting with video and audio recording. After getting my feet wet with a few projects, I decided to undertake the challenge of documenting a person’s life, career and, in this case, some very unique photographs. Since 2005 I have had the good fortune of playing regularly with master drummer, Jimmy Wormworth on a weekly show with the iconic Annie Ross. On one of our first gigs together Jimmy pulled an old snapshot out of his pocket, handed it to me with a playful grin and said, “Who’s that?” After examining the slightly tattered photograph I realized that it was none other than my bass hero, Paul Chambers, sipping from a bottle of Gordon’s gin backstage while standing next to the legendary pianist, Wynton Kelly. Every week thereafter, Jimmy showed me more shots that truly amazed me. I then learned that when Jimmy was in his early twenties he was the drummer for the hot, new vocal group, Lambert, Hendricks and Ross. He was on tour with them from 1959 to 1961, sharing concert bills with all the top jazz groups of the day. Backstage Jimmy was not only rubbing elbows with the giants of jazz, he was also snapping photographs with his Brownie camera, documenting these legends in a very candid light. I was immediately intrigued and inspired to do something to help Jimmy share these photos and his stories with the world. This documentary is strictly a labor of love and not for profit in any way. My only goal is to share Jimmy Wormworth’s fascinating life story and his beautiful photographs. I hope you enjoy this film, the making of which was an amazing experience and opportunity for me to learn and grow. I am truly grateful for all of the many people who contributed to and helped out with this project. P.S. Please spread the word and long live Jimmy Wormworth! BROADWAY — first recorded in 1940 by the Count Basie band — was composed by Henri Woode (the real author of ROSETTA, I am told), Teddy McRae (tenor saxophonist) and the little-known Bill Bird. An irresistible riff tune, it had lyrics put to it — probably by Dave Lambert and Jon Hendricks. It’s a familiar jazz song, one that most people would identify as exemplifying a certain kind of cool swing — and it’s durable, as this 2015 performance shows — part of the common language for a core of sympathetic well-versed players. I am told that Hot Lips Page would say — about jazz repertoire — “The material is immaterial.” True enough, and he would have opened his case, taken out his horn, and joined this session. Having a large jazz orchestra in this century has often posed challenges besides the economic ones. Many “big bands” get formed only for special occasions and are thus not well-rehearsed. Then there’s the matter of repertoire: should a band made up of improvising jazz players go into the past or boldly plunge into the future, however one defines it? Or should such an orchestra bridge Past and Present — not an easy thing: it means more than letting the saxophone soloist play GIANT STEPS licks in the middle of A STRING OF PEARLS. 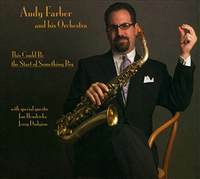 Saxophonist Andy Farber has found his own answer to these questions. He’s worked with all kinds and sizes of ensembles comfortably. But his own orchestra has found its own path that pays homage to the past without being anyone’s ghost band — in a way that’s both reassuring and innovative. Here’s what Andy told Alvester Garnett, who not only plays wonderful big band drums but also wrote fine liner notes (! ): “The goal of this record is to focus on the emotional and spiritual element of large group ensemble playing. I feel like there is a great amount of nuance in this band, ao conscious effort in playing pretty, shaping lines, playing parts as if it were a solo.” Does that give you a sense of the silken textures Andy and his Orchestra have created? You don’t have to take it on faith. The band sounds wonderful — and its overall sound is not heavy or ponderous, nor does it make you wonder what all the players in the band are doing (some “big bands” quickly break down into soloist-plus-rhythm that you wonder if the other players have gotten off the bandstand to check their email — not here). And the names of the players will tell you a great deal. Andy himself is a fine solo player (as I hope you’ve seen in my videos of him sitting in at The Ear Inn): here he’s joined by Dan Block, Chuck Wilson, Jay Brandford, Marc Phaneuf, Kurt Bacher, saxes (with a special guest appearance by Jerry Dodgion); Brian Pareschi, Irv Grossman, Kenny Rampton, and Alex Norris are the trumpets; Art Baron, Harvey Tibbs, Wayne Goodman, Max Seigel the trombones; Bob Grillo plays guitar; Mark Sherman, vibraphone; Kenny Ascher, piano; Jennifer Vincent, bass; Alvester Garnett, drums. And there is some hip vocalizing from the Prince of Hip, Jon Hendricks and his Singers. The repertoire includes the happily familiar (BODY AND SOUL, MIDNIGHT, THE STARS AND YOU, THE MAN I LOVE, SEEMS LIKE OLD TIMES, JACK THE BELLBOY) and Andy’s witty, swinging originals (SPACE SUIT, BOMBERS, IT IS WHAT IT IS, and SHORT YARN) — and more. All sinuously played, with a delight in sound rather than volume, texture rather than speed. If someone were to ask me the honorably weary question, “Are the big bands ever coming back?” I would play them this CD. This band has no need to return: it is most reassuringly here. The CD is on BWR (Black Warrior Records) and can be found at better record stores everywhere? Well, not quite — but it is available online through a number of sites and (of course) from Andy when you see him playing, which I urge you to do. “There are eight million stories in the Naked City. This is one of them.” That was the introductory voice-over I remember from the fabled television show depicting New York City’s urban grittiness. I don’t know how many stories there are as I write this in July 2008, but here is my story — one man’s nearly obsessive quest to soak up all the choice live jazz possible before leaving New York for a long pastoral summer vacation. The score at the moment is (approximately) four Kellsos, two Asheries, two Aldens, one Hendricks, and so on. Tally up the totals at your own peril. On Sunday, June 29, I took my position at THE EAR INN (326 Spring Street), knowing that the Earregulars would swing out in inimitable fashion, and a quartet of Jon-Erik Kellso, Dan Block, Howard Alden, and Frank Tate devoted themselves to some surprising music: a rousing “Ring Dem Bells,” “When I Take My Sugar To Tea,” then, joined by the brilliant alto / flute player Andy Farber, who leads his own seventeen-piece band at Birdland on Sundays, they stretched out on “Russian Lullaby” and “Sometimes I’m Happy,” before ending with a jam session on “Honeysuckle Rose,” made even more brilliant by violinist Craig Eastman, Frank Tate’s talented cousin. The music was stirring, the camaraderie was happy: I got to meet and talk with the owners of an upscale Australian chocolate company (www.chocolategrove.com), Will and Dianne Muddyman, in town to show off their products at the Jacob Javits Center. They are a lovely couple, funny and well-informed: we were trading names of Australian jazz heroes in spirited fashion. On Tuesday, July 1, I made my way to ROTH’S WESTSIDE STEAKHOUSE (630 Columbus Avenue at 93rd Street) to hear the weekly duet — in this case, pianist Ehud Asherie and Howard Alden. Listening to their inspired teamwork, I thought often of the 1941 “Waiting for Benny” warmup session captured by Columbia’s engineers that brought together Charlie Christian and Johnny Guarneri, Alden’s single-string lines perfectly complementing Asherie’s stride and walking tenths. Their repertoire was magically wide-ranging, moving without strain from Waller’s “Viper’s Drag” and “I’m Crazy ‘Bout My Baby” to Monk’s “Ruby My Dear,” Morton’s “Shreveport Stomp” and “King Porter Stomp” with all their strains properly attended to, as well as a Fred Astaire cluster of “Change Partners” and “I Won’t Dance.” Barbara Rosene (high-class local talent) sat in and sang a pretty, yearning “I’m Confessin’,” and the duo offered a delightful Brazilian contrapuntal song, “Lamentos,” which was new to me (Ehud said it was a choros, although whether I am using the term correctly I have no idea). Here, too, the pleasure was personal as well as gustatory (he steaks are excellent at Roth’s): I met the genial owner Marc Roth, a committed-to-the-point-of-piety jazz fan who donates his time and energies to the Jazz Foundation of America. It was a real pleasure to meet a club owner who sees good music as integral to his business. Two days later, I visited Ehud and Jon-Erik again, this time for a Thursday duet session at SMALLS (183 Tenth Street at Seventh Avenue South) with the compact room filled more than usual, which pleased me greatly. As I climbed downstairs, they were floating through a truly slow “Keepin’ Out of Mischief Now.” The tempo made that song (often turned into a quick-step) into a wistful love ballad. But their next tune, a “Whispering” that kept turning into “Groovin’ High,” was just as rewarding, and I noted that these two players have been more intuitively connected each time I’ve heard them — two like-minded improvisers turning into a team reminiscent of Hackett and McKenna, Braff and Hyman. It was a most rewarding hour. Oh — and the personal angle? When I walked in, I heard a pleased voice (in an accent that wasn’t Queens) say my name, and I turned around to see a beaming Will and Dianne at the bar. We had an even more lively chat afterwards — with hopes for a more leisurely encounter in the future. We didn’t hear any live jazz on July 4 — but since Louis thought that day was his birthday, it has the status of a sacred day. On Saturday, July 5, the Beloved and I went to the JAZZ STANDARD (116 East 27th Street) to catch the early show of what was billed as “Lambert, Hendricks, and Ross Redux,” featuring one of the elders of the tribe, Jon Hendricks — now eighty-six, dapper and bouncing in a yellow blazer — his daughter Aria, and the anchor of the trio, Kevin Burke Fitzgerald. At eighty-six, Hendricks manages vocal calisthenics with the skill and wit of a man one-third his age. He led the trio rather than keeping up with it. Aria has a lovely, supple vocal instrument and a dynamic stage presence; Fitzgerald not only sang his parts wonderfully but stopped the show twice, hilariously impersonating a muted brass player, then an arco bass soloist — magical impersonations, theatrical as well as musical. He’s a true star and he deserves to be widely known. Sunday, July 6, was a Kellso-and-friends doubleheader. I found my way to a new spot in the Broadway restaurant district, the sympathetically-named BOURBON STREET (346 West 46th Street), where the band was scheduled for their first brunch appearance (12-4). All the omens and portents were good: the restaurant is a huge space, two floors with high ceilings, marble floors, and a wrought-iron balcony. This isn’t simple decoration: the band was positioned on the second floor, playing without amplification, and their sound was brilliantly resonant, the room “live” the way such places used to be. The quartet was an uptown version of Kellso’s gifted crew, with Dan Block on clarinet and tenor, John Gill on banjo, guitar, and vocals, and Kelly Friesen on bass. And I got to sit with Doug Pomeroy, renowned audio engineer and deep-dyed jazz listener, so that we could trade inside stories. Musically, it was one of those extra-special occasions where the jazz was quiet but rose to new heights on every song, from a hymnlike “Old Fashioned Love,” to a floating “I Can’t Believe That You’re In Love With Me,” and intense explorations of “Wabash Blues” and “Apex Blues.” Jon-Erik and Dan are profound soloists and deeply attuned team players, filling gaps, finishing each other’s sentences. Kelly Friesen nimbly managed to bring together the great slap-bass he learned from Milt Hinton and witty bebop references. John Gill provided his own recogniable pulse, wonderful chord voicings — and his own Bing Crosby-inspired versions of “When You’re Smiling,” “an uptempo “Pretty Baby,” “Sweethearts on Parade,” and — for a socko finish, “When Irish Eyes Are Smiling.” The Irish connection? One of the owners, Brian Connell, hails from Blanchardstown, a Dublin suburb, and we traded local lore. I hope that the place prospers as a site for live jazz: the acoustics are wonderful, the food delicious, the staff cheerful. After a brief interval devoted to non-jazz realities, I drove downtown to The Ear Inn for a hail-and-farewell* Sunday night with The Earregulars — Jon-Erik, trombone marvel Harvey Tibbs, bassist Pat O’Leary, and guitarist Chris Flory — joined for the second set by Dan Block, on his third gig of the day. If the mood at Bourbon Street had been distinctly New Orleanian, this band had its heart firmly set in late-swing-early-bop (think 1946 Savoy, Keynote). Perhaps without any hidden egocentrism, they chose songs for the second set that had their first word in common: “I Never Knew,” “I Want A Little Girl,” “I Would Do Most Anything For You,” a heartfelt “I Only Have Eyes For You,” featruing Dan, Chris, and Pat, and “I Want To Be Happy.” A closing “C Jam Blues” broke the pattern but was a delicious slow-rocking exploration. I got to chat with Jackie Kellso and the young trombonist Emily Asher (known for her work with the ensemble “Mighty Aphrodite,” which lives up to its billing) — another pleasure. I don’t know if I could keep up this pace on a regular basis — occasionally my eyes threatened to close of their own accord, and I did go outside and stand on the street between sets to gulp some air — but my jazz marathon was richly rewarding. Never fear, though, loyal readers: I will be posting on this blog wherever I go. *I was doing the farewelling: happily for New Yorkers, that band will continue even when I’m not there. Reassuring, that.